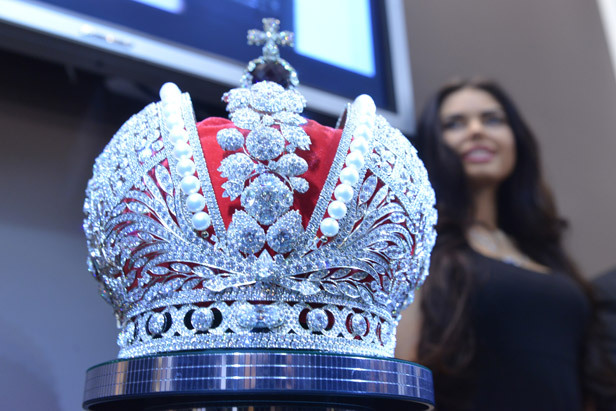 It took two months to make the replica of the Grand Imperial Crown that was showcased at a jewelers’ forum in St. Petersburg. Sixty jewelers from Smolensk made it for the 250th anniversary of the coronation of Catherine the Great and the 400th anniversary of the Romanov dynasty. 11 thousand diamonds adorn the white gold crown. The Imperial Crown of Russia, also known as the Great Imperial Crown, was used by the Emperors of Russia until the monarchy's abolition in 1917. The Great Imperial Crown was first used in a coronation by Catherine II, and was last used at the coronation of Nicholas II. Since December 20, 2000, the Imperial Crown has appeared on the Coat of arms of the Russian Federation. It is currently on display in the Moscow Kremlin Armoury State Diamond Fund. No one allowed even to touch that, and therefore that replica is the only one in the world. Jewelers sure that the second replica will never be made. The replica will be exhibited in several Russian cities later this year.